There are numerous advantages to having straight teeth, including but not limited to better oral health, a more attractive appearance, and improved self-confidence. When you make the decision to receive orthodontic treatment, whether it’s by braces or Invisalign, you are taking the first step on the path to a beautiful and healthy smile. Unfortunately, orthodontic treatment is a slow, painstaking process. Even though the results are well worth the time and investment, your journey towards a perfect smile can potentially take years. What if there was a way to significantly reduce your orthodontic treatment time? That’s where we come in! We at BSF Orthodontics are proud to announce the launch of the Propel System this week in our Fort Worth, Arlington, Keller, and Burleson offices. With the system, our patients’ orthodontic treatment will be faster than ever before, regardless of whether they’re wearing braces or Invisalign. You might be wondering exactly how the Propel System works. The process is easier than you would think. Basically, the Propel system accelerates the rate at which teeth are moved. The process occurs via a simple three-step in-office procedure that Drs. Birth, Stewart, and Fletcher can perform in minutes. Your orthodontist will use the Propel device to stimulate the alveolar bone in your mouth. This stimulation leads to faster bone remodeling. 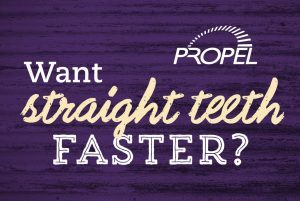 Studies have shown that when the Propel System is combined with orthodontic treatment such as Invisalign or Braces, patients’ teeth can move into their correct positions up to 60% or more faster!